In 1989 UN experts called Karabash in Chelyabinsk Oblast (2200 km from Moscow) the “black dot of the planet.” If you go to the Cross of Repentance over Karabash, what a person can do to nature becomes clear: Bald black mountains, orange water, land cracked like that on Mars. The city is called an “apocalypse of living nature.” Since 1974 copper smelting, which has destroyed all life within a radius of tens of miles, has attempted to be shut down several times. This was successful only in 1989. Poisoned mountains continue to erode, as erosion was not successfully stopped after feeble attempts at remediation. 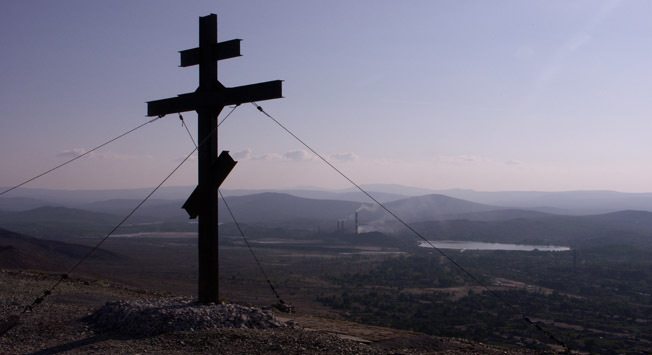 From the top of the mountain with a cross, which is known as “Bald” (Lisaya), it becomes clear that the language of the dead, toxic sludge more closely resembles the beautiful lakes of Chelyabinsk. On the other side of the mountains, black ranges of slag dumps are visible, the foot of which shelters the huts of locals. Those who have visited the “black spot” tell of witnessing a surreal experience from the copper valleys, and compare Karbash with “the boundary between two worlds”: the living and dead. In this city that has never been blessed with beauty or unusual ancient architecture, and is situated in the north of the Krasnoyarsk territory (2800 km from Moscow), lies black snow and the air tastes of sulfur. This territory was used for the production of heavy metals — copper, nickel, lead, selenium and zinc. The city and its residents became contaminated by the waste of their production. It is an environmental hazard to the population of the city and the surrounding areas due to the fact that Norilsk is a derivative of one of the world's largest mining and simultaneously metal-producing plants. The factories of Norilsk smelt ore on the permafrost, producing more than 40 percent of the world’s palladium, nearly one-fifth of Russian nickel and two-thirds of copper. Counterparts of the industrial region Norilsk (the primary city) are not found anywhere in the world. For many years, Norilsk has retained its status as the dirtiest city in Russia. Although the city has no official status as a closed territory, since 2001 the entry of foreigners into the city has been prohibited and is possible only with special permission from authorities. On the impressive Kamchatka peninsula, famous for its ridges of volcanoes and clean untouched nature, is a surreally beautiful but deadly dangerous lake of a bright-turquoise color, situated in the crater of the volcano Maly Semyachik (6700 km from Moscow). The diameter of the lake is about 500 meters and its depth is roughly 140 meters. Despite the fact that the lake even has its own “beach,” swimming in it is not worth it even for the most fearless extremists: The chance of exiting the lake unharmed is zero. It is an acidic lake, which was formed by a powerful underground explosion about 400 years ago. The composition of the water includes an abundance of sulfur, fluoride, chloride and sulfate acids. It is because of this “explosive mixture” that the water of the lake in the crater of Maly Semyachik has such a fairytale-like turquoise color. The acidic lake in the crater does not freeze in the winter, even when all the slopes of mountains in Kamchatka are covered with snow. Maly Semyachik and its acidic lake are not always quiet — the volcano is active, but its last known eruption occurred in 1952.